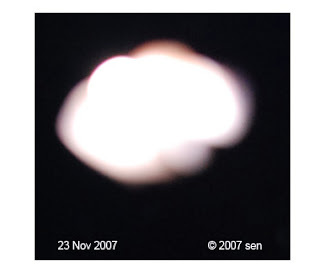 My article “about the UFO photos” which I posted on April 25 2008 revealed that there are three types of ufo pictures: blurry shapes of energy, Semi-detailed and Exposed. If you cautiously analyze the pictures & videos that taken by people, you will find that most of them are first type, the shapes of energy emitted by the UFO , including some are that are effects ( absorb & reflection) from the surrounding environment , so the object covered by their blurring or glowing energy field, does not show any of its details. I studied many ufo photos from the web. few belong to the Semi-detailed type, even fewer are the Exposed type. To reading the Exposed photos are very simple, they usually has many feature, even you know they are not belong to our earth. But recognizing that these first two kinds of photos are not easy, that is why they have been ignored or explained wrongly. The key is that you must learn what kind of unearthly objects usually appear in our sky. most real UFOs are astral species and there are so many different kind of them. therefore you need to know what those living things look like. also you should learn a bit about their behavior too. to study a UFO objects you need lot data in hand. I cannot understand how the people doing research without any these kind of information and this is what happened in last 60 years. For example, the attached image, was captured on the 23 Nov 2007, the invisible object’s size as big as the small table top. as it does not show much detail, it only fits into the first kind of UFO picture. Additionally, to verdict what is the object approximately is, we must compare it with information we have. This information must be the image of the alien( for this present time): the exposed type photos, you only can get it when the Alien comes out of UFO.